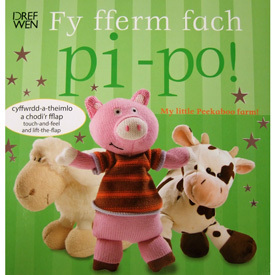 Welsh-English bilingual edition of Farm Peekaboo! Fy Fferm Fach Pi-Po! 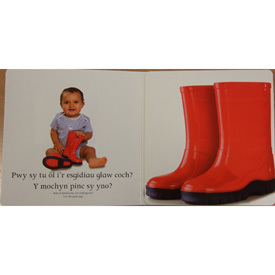 / My Little Peekaboo Farm is a sturdy board book that will help babies and toddlers to understand basic Welsh and English words and phrases. On each page, there are different textures for baby to touch and feel as well as fun fold-out peekaboo flaps. There are a couple of simple Welsh sentences per page with the text in English printed in smaller print underneath.